A day after directing criticism at President Donald Trump in his first big political speech since leaving the White House, Barack Obama spoke again of the perils of divisive politicians at a Democratic rally in California on Saturday. Though Obama did not name Trump, his successor has been in power for two years. 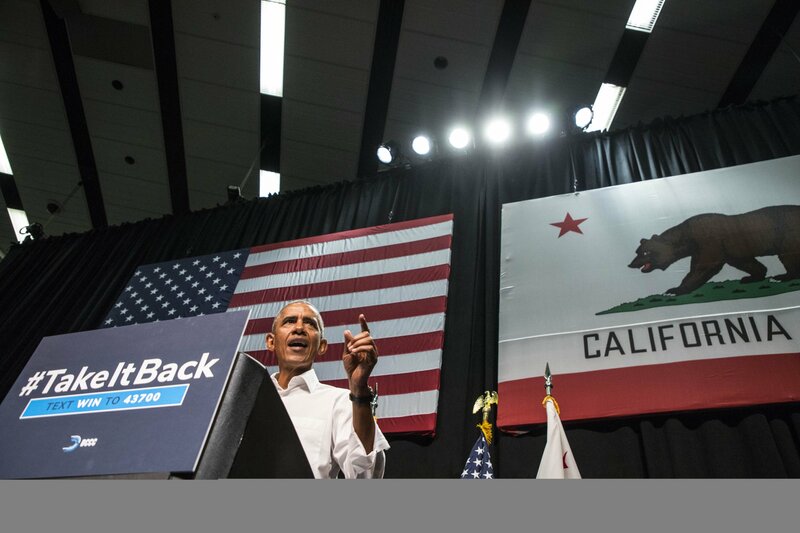 Obama’s speech in California, an effort to campaign for seven Democratic candidates ahead of the midterm elections, hit similar themes to remarks he made on Friday at the University of Illinois. “We are Americans, we’re supposed to stand up to bullies. Not follow them. We’re supposed to stand up to discrimination, and we’re sure as heck supposed to stand up clearly and unequivocally to Nazi sympathizers,” Obama said. Trump had referred to some far-right protesters as “very fine people” after they killed one woman at a rally in Charlottesville, Virginia. While Trump frequently bashes his predecessor, and seems to have made it a point to undo his landmark policies and legacy, Obama had mostly refrained from attacking Trump. He has returned to the campaign trail ahead of pivotal midterm elections approaching, as Democrats seek to capitalize on the slew of scandals that surround the president, his administration, businesses, personal life and links with Russia to take back the House or the Senate or both. On Saturday Obama implored Americans to vote. "The biggest threat to our democracy,” Obama said, “It's not one individual. It's not one big Super PAC, billionaires. It's apathy, it's indifference. It's us not doing what we're supposed to do."